The ideal data dictionary is automated, interactive, online, and evolutionary. As the systems analyst learns about the organization’s systems, data items are added to the data dictionary. On the other hand, the data dictionary is not an end in itself and must never become so. To avoid becoming sidetracked with the building of a complete data dictionary, the systems analyst should view it as an activity that parallels systems analysis and design. To have maximum power, the data dictionary should be tied into a number of systems programs so that when an item is updated or deleted from the data dictionary, it is automatically updated or deleted from the database. The data dictionary becomes simply a historical curiosity if it is not kept current. The data dictionary may be used to create screens, reports, and forms. For example, examine the data structure for the World’s Trend ORDER PICKING SLIP in Figure 1. Because the necessary elements and their lengths have been defined, the process of creating physical documents consists of arranging the elements in a pleasing and functional way using design guidelines and common sense. Repeating groups become columns, and structural records are grouped together on the screen, report, or form. 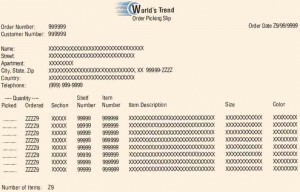 The report layout for the World’s Trend ORDER PICKING SLIP is shown in Figure 2. Notice that FIRST NAME and LAST NAME are grouped together in NAME, and that QUANTITY (PICKED and ORDERED), SECTION, SHELF NUMBER, ITEM NUMBER, ITEM DESCRIPTION, SIZE, and COLOR form a series of columns, because they are the repeating elements. 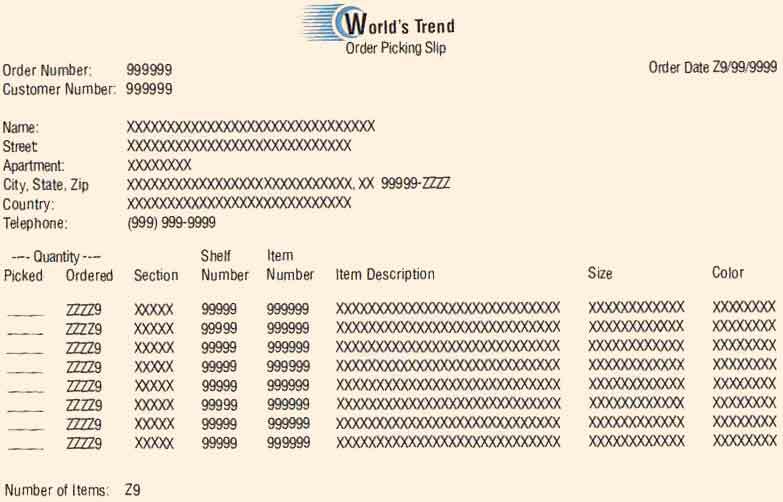 Figure 1 – Data structure for an order picking slip at World’s Trend Catalog Division. Figure 2 – Order picking slip created from the data dictionary. All base elements on an output data flow must be present on an input data flow to the process producing the output. Base elements are keyed and should never be created by a process. A derived element must be created by a process and should be output from at least one process into which it is not input. The elements that are present in a data flow coming into or going out of a data store must be contained in the data store. If begun early, a data dictionary can save many hours of time in the analysis and design phases. The data dictionary is the one common source in the organization for answering questions and settling disputes about any aspect of data definition. An up-to-date data dictionary can serve as an excellent reference for maintenance efforts on unfamiliar systems. Automated data dictionaries can serve as references for both people and programs.